A couple times a week, someone will come up to Lola Kirke and call her “Hai-lai,” parroting the loving mispronunciation of her Mozart in the Jungle co-star Gael García Bernal’s conductor character Rodrigo. As far as crosses to bear go, she admits it’s a fairly light one. “It’s cool to hear it— I’m so happy to have been part of something that resonates with people,” Kirke says of the Amazon television program, which ended its fourth and final season earlier this year. Set in the drama-packed world of classical music, the show explores the dynamics of romance, but also the mechanics of the creative process. For Kirke, who’s appeared in films like Gone Girl and Gemini, its central theme — how do you stay true to your art? — influenced her other gig, that of a singer/songwriter. Earlier this year, she released her AM Gold radio-tinged debut Heart Head West, and she’s just followed it up with a Christmas single, “Cross You Off My List b/w Little Drummer Girl,” which you can hear more about in the latest episode of our Transmissions podcast. Speaking with Aquarium Drunkard, the actor/songwriter connected the threads between her dual disciplines. Aquarium Drunkard: You grew up in a musical house. What was the first music that you loved on your own? Lola Kirke: I can’t pinpoint exactly, but growing up I had this school bus driver named Rohan and he listened only to 101.1, which was the classic oldies station. I thought I sounded like Otis Redding to a T. It was delusional, but I would sing along in my Otis Redding voice as a seven-year-old child. I learned a lot about music those mornings on my long ride to school, particularly about soul music and rhythm and blues. The first bands I was obsessed with? I remember calling my mom when I was in the fifth grade so she would go into my room and turn on the Strokes CD, Is This It, so I could hear it at school. I had never seen people that looked like that. They were doing this throwback to a time I didn’t know existed because I was 11 and didn’t know had already occurred. I just felt that they were these [cool] long-haired boys [laughs]. AD: That record sort of sounds like it was recorded on a phone. Lola Kirke: It definitely does. I loved Led Zeppelin so much. “Since I’ve Been Loving You,” that was one of the first songs I ever heard that I just didn’t understand how that could exist. It was the most perfect blend of ballad and raucous screaming…that was an early one. As I became more of an adolescent, I really got into the Grateful Dead, Gram Parsons, and the Band. I remember having pneumonia when I was 13 and listening to Music From Big Pink pretty much [nonstop]. I listened to “Lonesome Suzie” alone in my room, basically being quarantined. Those were the foundations. I’ve always loved music from the late ‘60s and ‘70s. AD: Was that ‘70s country rock thing what you had in mind when you first started writing songs? Lola Kirke: Yeah. I got a ukulele. That seemed less intimidating to me, and it was 2008, and I was a white girl [laughs]. The two things just kind of — [I was] magnetized to a ukulele. Country music was the first music I really started playing. I played the Patsy Cline song “Crazy” — that was the first song I learned to play. A lot of my writing came out of a country background, just because it seemed manageable to me. AD: You’re in a great film this year called Gemini, which really takes the noir template and brings it into the present. Is that something you seek to do with your music as well, kind of bring those ‘70s sounds into a modern context? Lola Kirke: I’m all for updating genres I love. It’s such a tricky issue in a lot of ways. You don’t want to update it too much, but you also don’t want to just imitate something. Participating in traditions that have breathed life into your own life is such an amazing experience. So “How do you do that but also be original?” is the question. In a lot of ways, I don’t believe in just disappearing into a role. I do believe in jamming with a character, though, the way you might as a musician. AD: Right. There’s a huge difference between inhabiting those sounds and simply “borrowing” them; how do you make something your own? 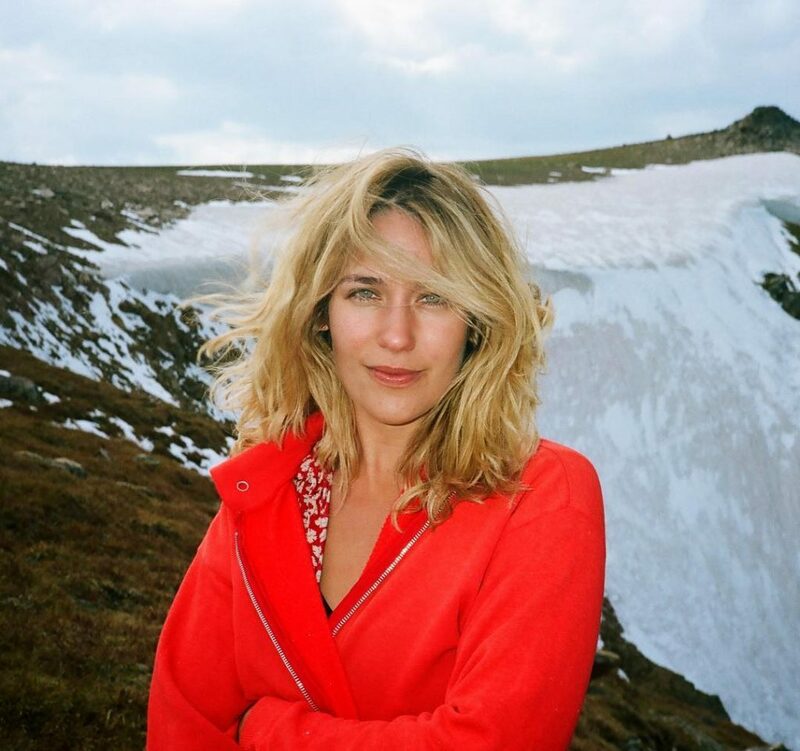 Lola Kirke: What I think will always make something real or important, regardless of how it manages to update a genre whatever, is if it’s honest and authentic. I think the risk with imitating at all — with mimesis as a thing — is that it won’t express what is true. It will just try and express something the way it’s already been expressed. I think maybe to me, my answer thus far: “How how can I just tell the truth?” That’s something I’m really interested in doing as an actor and as a singer/songwriter. I’m interested in that as a listener and viewer of art, too. AD: When you’re acting, is part of the goal to disappear, to basically become the character? Lola Kirke: I think it can happen. As an actress, I’m much less interested in disappearing than I am in using things I wished would just disappear — trauma and pain — to enliven things. In a lot of ways, I don’t believe in just disappearing into a role. I do believe in jamming with a character, though, the way you might as a musician. I’ve never had this happen with the guitar, but I’ve had it with the bass before, where I felt like the bass was an extension of my body. It only happened very briefly and I know that a lot more experienced musicians feel that a lot, but I think in a way it’s a merging that can occur that I’m really interested in, rather than an absence. AD: You practice these two art forms, music and acting. Do they feel connected to you? Lola Kirke: I definitely think acting and songwriting come from a similar place. With songwriting, it’s just more available to me. I don’t have to wait until I find a character or I’m given a job that asks me to use that experience to enliven it. With songwriting, if I’m lonely or angry, whatever it is I want to express through songwriting, I can just do it. AD: Mozart In the Jungle is a great romantic comedy, but I also think it’s a show about how to live an artful life, how to really grapple with approaching everything you do artistically. Did that show, which obviously focused deeply on music, change your own relationship with music?